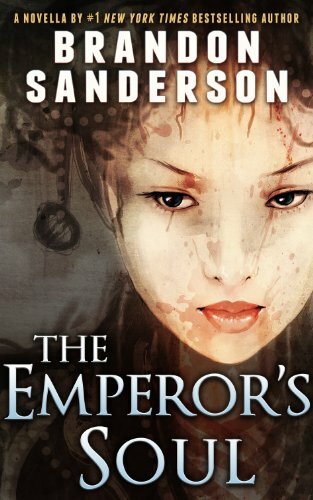 From #1 New York Times bestselling author Brandon Sanderson, The Emperor's Soul showcases a fascinating magic system as the clock ticks down for a condemned criminal. A note from the publisher: Brandon will send a free copy of this ebook to anyone who purchased the Tachyon Publications trade paperback. See the title page in the ebook preview for details. dhen (Grade: A+) If a book's efficiency is defined as having the highest quality with the fewest amount of words, I would have to say, this takes the cake. A very short novel, but one that allows for character development none the less. I've enjoyed every Sanderson read thus far and this was no exception. Obie (Grade: A+) I really enjoyed the unique magic system that was built for the novella. I also found the themes of artistic integrity fascinating. The pace of the book is kept very fast and the characterization is well done considering the length of the book. Sanderson did a wonderful job with everything even though most of his books are over 500 pages long. Zack (Grade: A) A short fantasy with a Sanderson magic system that pushes this one over the edge. Fun read. emilia83 (Grade: A) It was short, but I really enjoyed the whole thing. It was fast-paced and kept me interested the whole time. Sanderson's creative magic systems are always fun to read about. Z-man (Grade: A) Apparently it's no longer good enough to watch Luke go from moisture farmer to Jedi knight. No, we have to follow Anakin from birth to forced retirement. Jason has to be reborn, reincarnated, reinvented, and rebooted ad nauseam in Friday the 13th. And forget, sequels, prequels, and even trilogies, Robert Jordan has decades of books that even continue past his own grave! Today’s greedy media has no concept of the word brevity. But no one says blow out the icing or that's a piece of frosting.